Formulated using components of the skin's natural moisturizing factor (NMF), this clinically proven blend combines antioxidants and humectants with biocompatible hydrators that provide superior hydration. The function and youthful appearance of all skin types is optimized by maintaining adequate moisture levels, significantly reducing transepidermal water loss (TEWL), and improving elasticity for soft, healthy skin. After cleansing, apply evenly to entire face and neck in the morning and evening for the ultimate in skin hydration. 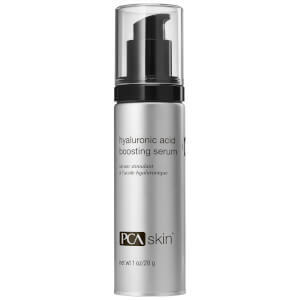 In the morning, finish with the appropriate PCA SKIN broad spectrum SPF product. Apply throughout the day for instant hydration of dry or parched skin. It may be used in conjunction with or as a replacement for any PCA SKIN nighttime moisturizer. Water/Aqua/Eau, Glycerin, Sodium Polyacrylate, Sodium PCA, Aloe Barbadensis Leaf Juice, Sodium Lactate, Gluconolactone, Sodium Hyaluronate, Wheat Amino Acids, Triticum Vulgare (Wheat) Germ Extract, Sodium Benzoate, Symphytum Officinale Leaf Extract, Panthenol, Saccharomyces Lysate Extract, Hydroxyproline, Urea, Niacinamide, Inositol, Glycine, Fructose. My skin felt SO hydrated the instant it absorbed into my skin and I couldn't wait to use it again! Definitely a new favorite! My skin specialist that I have been going to for 10 years suggested this brand for my sensitive skin. I especially like it for the winter months.